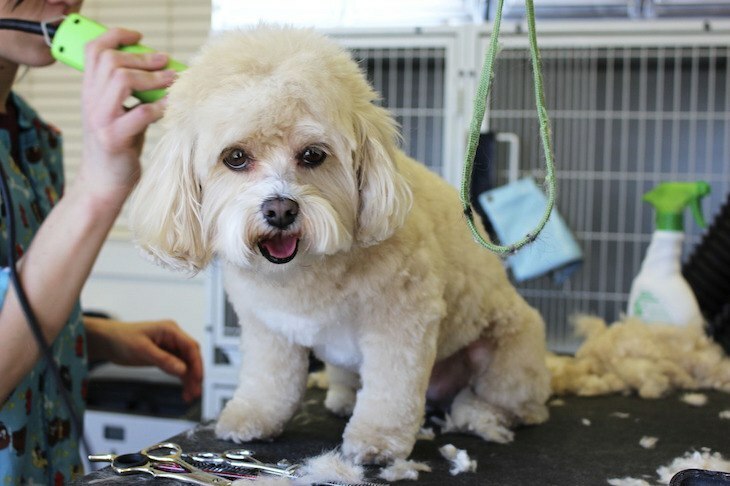 Dog owners generally prefer to have their dog’s haircut done by professionals. Let us take a look into how to give your dog a haircut at home, as it is a cumbersome task that requires proper know-how and experience – particularly for those dogs who have continuously growing, long hair. But, that doesn’t mean that you cannot become an expert at cutting your own dog’s hair! There might be some hilarious results on the way, but the hair eventually grows back within a month, and eventually, the disastrous initial attempts would turn out to look much better! Any style of clippers can be used rather than specialized dog clippers. Make sure that your clippers have sharp blades. Dull Clippers will pull the hair unnecessarily. Read this best dog clipper buying guide for more information. Specialized blades that are meant especially for the type of coat your dog has, must be bought. If you are not sure about using the blades, the Snap-on Guide combs can be used to help you make a uniform cut. As some areas around the paws are a little fiddly to use with clippers, a sharp pair of scissors can be used. Using Clipper lubricants or coolants prevents the blades from getting too warm and burning your dog. HOW TO PREPARE FOR A DOG’S HAIRCUT SESSION? Bathe your dog well with a dog shampoo. Do not use human shampoo as may cause skin irritation. Towel them dry. Position them comfortably on a table and wait until dry completely. Once the fur is dry, gently brush or comb your dog, to remove any snags, mats or tangles from their coat. Select a quiet place, free from any distractions. Keep in mind- the hair will end up everywhere, so pick a spot that’s easy to clean. Clipping up on a kitchen table (lined with a non-slip mat) can be a great place to groom since it is elevated and convenient to maneuver around without straining your back. When you start out, it is ideal to have someone hold your dog. Before you turn on the clippers, make sure your dog is properly bathed and his coat is free of mats or tangles. Hold the clippers in your hand in a way that gives you the most control over them, and feels comfortable at the same time. To find out how to use your clippers, start by grooming the inconspicuous areas where the fur has already been trimmed and has grown to be a little untidy. This way you would know how much hair your clipper and blade take off. If the amount of hair removed is too little or too much, you can adjust the blade size to a more appropriate blade. It is very important to select the right size of blade that would work best for your dog. The higher the number of the blade, the shorter and finer the cut. Start cutting your dog’s hair first at the head as it is risky and sensitive area. It is always good to start first with risky area to have more attention. Shave the sides and the nose in quick, uniform strokes. Around the eyes, make sure there is no hair growing over the eyes that could interfere with its vision. If your pet tends to move a lot, it is best to use blunt, curved scissors around the eyes instead of the clippers. Trim your dog’s ears by holding them in your hand and slowly move the clippers over them. Give them dog-treats to calm them down in case they tend to fidget. Start at the junction of the dog’s head and neck, and continue clipping down the body, giving quick, uniform strokes. Move down along the dog’s backbone, followed by the each side proceeding to the tail. Finally, trim the dog’s belly hair. Clip the hair on your dog’s legs, starting at the top working your way down to the paws. To clip the hair on the paws, brush against the direction of hair growth to push the hair which is in between the toes upwards, and trim them using a sharp pair of scissors. Clippers can be used to trim on the underside of the dog’s feet. For matted dogs, the use of clippers can be very painful. In such cases, it is necessary to remove the mats first using a De-Matting Comb. These combs look like a comb except they have a sharp edge that cuts through the knots. Carefully, move the De-Matting comb through the mat, holding down the hair closest to the skin in order to prevent pulling the mat and causing unnecessary pain to the dog. Never cut into a mat with a pair of scissors as you could cut the dog’s skin if it were to move all of a sudden. If the mats are not too close to the skin, clippers can be used on the shortest setting to remove the mats. Start with a section where there are no mats to get the base of the fur coat. If your dog is really matted, it’s better to shave him down or get him groomed by a professional as this process can be really painful. You might end up grooming your matted dog successfully, but the dog would protest the next time you try to clip his hair. After a professional haircut session for your matted dog, maintain the coat with regular brushing and clipping, thereby preventing the mats from developing again. Frequency of Grooming: If your dog has a continuously growing coat, a grooming session every 6-8 weeks is ideal. If your dog feels a lot of heat, clipping around the belly will help it cool down when it lays on the ground. If you brush your dog regularly, you can prevent mats from forming which will not require grooming. However, if your dog mats easily, it is ideal to clip their hair short more often. Read this guide about best dog brush for shedding to find the best brush for your dog. If your dog gets nervous with the sound of clippers, it is best to get him accustomed to their sound first. Initially, its best to keep the air cutting sessions short. You could have an additional helper to give your dog treats when it behaves well and stays still, even for a short period of time. Eventually, your dog will get accustomed to the sessions, complying with you; cutting his hair at home would be a cake-walk! It’s best to start clipping your dog as early as possible, even as a puppy. Older dogs are much harder to train. Compare the sound levels of various clippers available and select the ones that make minimum noise. When clipping, it’s best to go in the direction of hair growth, not against it. Take advice from a professional groomer or breeder to get information on how to clip your dog’s coat. Even if you make a mistake, don’t fret. Your dog will end up having a “Bad Hair Day” but eventually, the hair will grow out. Hug, love and treat your dog while it complies with you as you groom her! Here you can watch the video for your dogs haircut.